Visually check the drain hole for coolant leakage. If leakage is found, replace the water pump assembly. 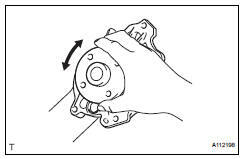 Turn the pulley, and then check that the water pump bearing moves smoothly without making a "click" noise. If it does not move smoothly, replace the water pump assembly.